The perfect foundation for fun and learning, the MySize Table & 2 Chairs Set from Delta Children features a smooth, wood top that make it extremely durable and easy to clean. Whether your child uses it for art projects, tea parties, snack time or homework, this kids play table and chair set will enhance their sense of wonder no matter what activity they use it for. 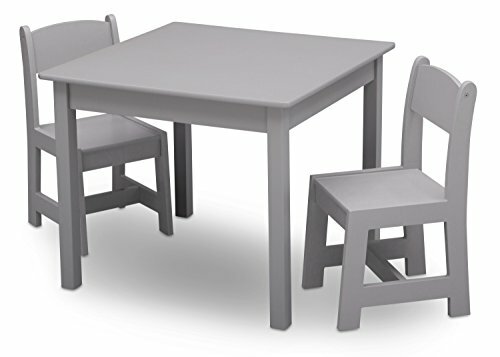 Sized just right for your growing child, the MySize Table & 2 Chairs Set will provide years of creative fun. The table's beautiful finish will complement existing bedroom, playroom or living room decor, easily allowing you to create a space that works for kids and adults alike. Available in a number of beautiful colors: Grey, Bianca White or Dark Chocolate. Coordinates with other items in the MySize Collection from Delta Children. Delta Children was founded around the idea of making safe, high-quality children's furniture affordable for all families. They know there's nothing more important than safety when it comes your child's space. That's why all Delta Children products are built with long-lasing materials to ensure they stand up to years of jumping and playing. Plus, they are rigorously tested to meet or exceed all industry safety standards. WEIGHT LIMIT: Each chair holds up to 50 lbs.